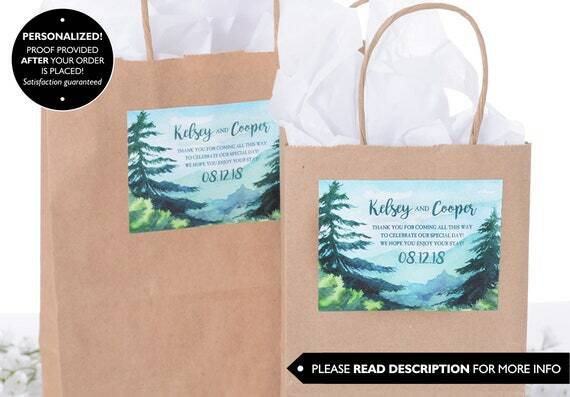 Custom-printed adhesive labels for your wedding bags and boxes! These labels come in three sizes, have a semi-glossy finish, and have an adhesive backing for easy application. Labels only - BAGS NOT INCLUDED. TO ORDER: Choose your total and desired size from the "Select Total & Size" tab and leave the QUANTITY tab at 1. Standard - 4" x 3"
Large - 5" x 4"
Jumbo - 6" x 5.2"
- Most orders are shipped within 24 hours of proof approval, but please allow up to 3 days in-house printing time unless you need a rush job. - Total turnaround time is approximately 4-6 days. - We can almost always accommodate rush orders. Convo us for details. - We ship by USPS Priority Mail. Overnight services are also available by request. - You will receive a tracking notification in an email from Etsy after we have shipped your order. *PLEASE NOTE: Our business hours are 10am-5pm EST. We DO NOT ship on weekends, with the exception of critical rush orders. Our postal service closes at 4:30 - all shipments cease after this time. LabelsRus has been in business since 1998. We are printing professionals who take our job very seriously. Etsy is not a hobby or part time job for us. We are known for our exceptionally fast turnaround and top-notch customer service. Creating and printing beautiful wedding products is what we're all about! If you're looking for a top notch team that will deliver top quality personalized items, we're ready and waiting to help you. Go ahead and message us and 90% of the time you will get a response within minutes.